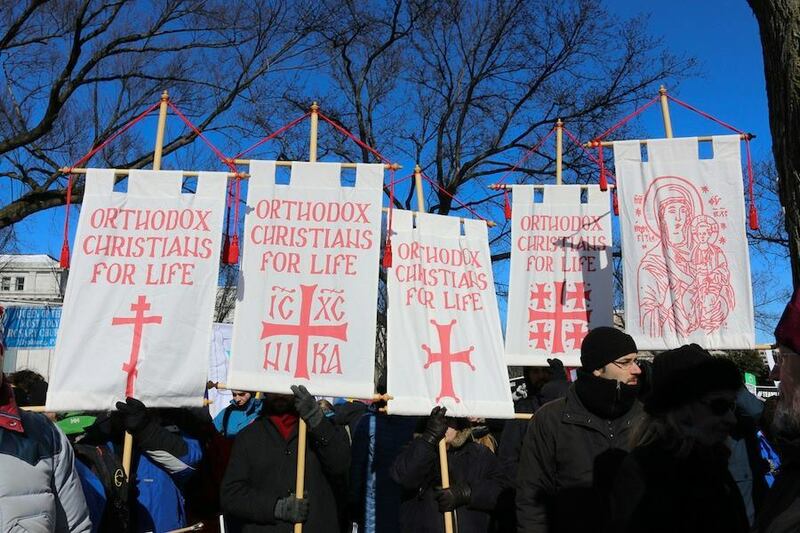 OCLife-DC is the Washington DC area chapter of Orthodox Christians for Life, the national Orthodox pro-life organization. The chapter focuses on prayer services and donation drives for local crisis pregnancy centers. Washington DC area have taken part in pro-life activities as early as in the 1980’s, most notably in 1989, when Mr. James Jatras, Esq of St. Katherine Greek Orthodox Church, Falls Church, VA, co-authored a brief that was submitted before the United States Supreme Court. The complete text explains why the Orthodox Church has opposed abortion since the time of the Apostles. It is available at http://www.orthodoxytoday.org/articles/OrthodoxAmicusBrief.htm. Coffee hour discussions at SS Peter and Paul Antiochian Orthodox Christian Church, Potomac, MD created interest in a local Orthodox pro-life organization. The first step was to bring together as many interested DC area Orthodox as possible to consider various courses of action. When Fr. Milorad Milosevich of St. Luke Orthodox Church in McLean, VA offered to host the first organizational meeting, flyers announcing the place, date and time were mailed to every parish in the area. At the first meeting, participants expressed a desire to establish a ministry offering alternatives to abortion, carried out along Orthodox principles. Several participants had been volunteering at local crisis pregnancy centers and realized that a ministry and Christian witness could connect with Orthodox Christianity, its sacraments and the Patristic teachings on chastity and family life. As the months went by, more meetings took place at churches around the area. Meanwhile, a list of regular mail and email addresses of people expressing interest was assembled. Each meeting was announced by sending flyers and e-mail follow-ups to interested people and also to each parish. In addition, people who attended the meetings took responsibility for making sure OCLife-DC activities came to the attention of their own parish priest, the parish council and the parishioners. - to educate the local community about what the Church has always taught about abortion. Periodically special Vesper Services are held at area Orthodox churches. The services include intercessory prayer for mothers in crisis pregnancies, for babies at risk of abortion, and for guidance and strength to those who seek to protect the babies and minister to the mothers, as well as prayers for the unborn, in general. These services are usually weekday Vespers with petitions taken from the OCA Sanctity of Life Sunday texts. (Texts for the petitions are available on the OCA website: http://www.oca.org.) There have also been molieben and paraclesis services. For the ill and the elderly that they may live out their days surrounded by care and attention. The annual Dormition Fast Donation Drive (DFDD) is held each August when OCLife-DC members representing all Orthodox jurisdictions organize and publicize parish wide collections of baby and maternity items for donation to two DC area pregnancy care centers. The Drive also brings crisis pregnancy centers and their work to the attention of Orthodox Christians. The centers, Shady Grove Pregnancy Center in Gaithersburg, MD and the Marih Center in Alexandria, VA offer free pregnancy tests to any woman who calls or walks in, followed by counseling that explains how abortion kills a living child. It offers practical support if the mother decides to have the child, e.g. low-cost prenatal medical care. Several Orthodox Christians volunteer at the Centers, and Fr. Miles Zdinak, pastor of Holy Resurrection Carpatho-Russian Orthodox Church, Potomac, MD serves on the board of the Shady Grove Pregnancy Center. Mr. Michael Thompson of St. Mark Orthodox Church, Bethesda, MD, composed a presentation package known as the “Pro-Life Parish Challenge,” a 20 minute talk explaining three important abortion issues in simple terms: “What really happens during an abortion,” “What the Orthodox Church has always taught about abortion,” and “What Orthodox Christians can do to live out their faith in this regard.” Many Orthodox have never had a brief, yet comprehensive presentation on the Church’s authoritative teachings on abortion, and thus, have not been able to realize that opposing abortion is fundamental to the Orthodox faith. A script of this presentation is available from the OCLife-DC contacts listed below. Washington, DC the evening of January 21st, just prior to the Annual March for Life that thousands of marchers attend. 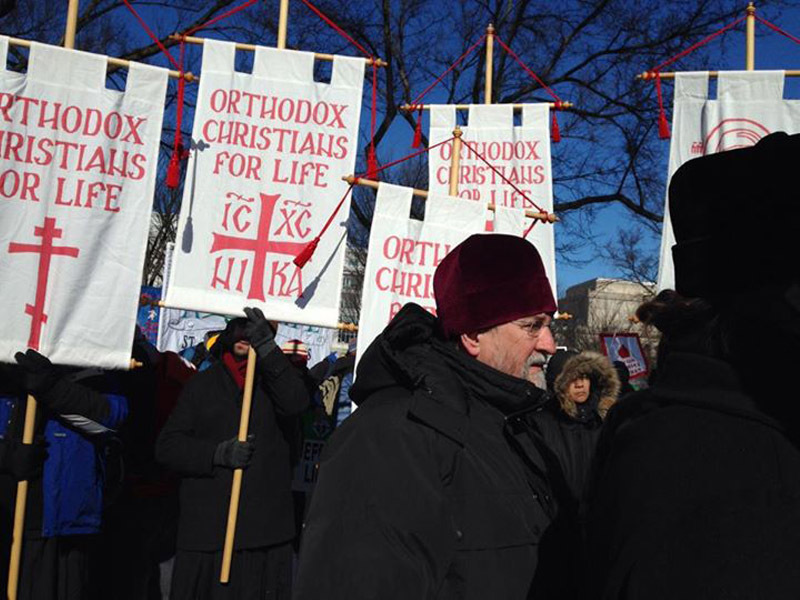 Metropolitan Herman of the Orthodox Church in America has presided at this Vesper Service since his election as primate in 2002 and has walked in the March for nearly two decades. The March for Life is held on January 22nd, unless that date falls on a weekend. Then it takes place on another designated day. It begins with a rally at Noon on the Ellipse near the White House. Hundreds of Orthodox hierarchs, clergy and laity from many states gather under the large banner with the icon of the Theotokos, Our Lady of the Sign. The March proceeds up Constitution Avenue, ending at the Supreme Court Building where a Memorial Service is offered by the Metropolitan and the bishops. OCLife-DC continues to work to add new members, to educate more parishes, and to maintain the pro-life Vespers and the donation drives. An OCLife-DC pamphlet is available that offers practical ideas on how to get started on your own OCLife Chapter. Abortion, Economia and the Hard Cases, Mat.Valerie Protopappas, pdf. Format, OCLifeHQ@aol.com. Orthodox Christians for Life Pro-life Handbook, Fr. Dn. John and Mat.Valerie Protopappas, pdf. Format from http://www.oclife.org. “Against Abortion but What Can We Do?” Becky Thurner, The Handmaiden. Conciliar Press, Vol. IV, No. 3, Summer 2000.
http://www.prolifeinfo.org These links take you to most of the major pro-life organizations. Lisa Jones has been the OCLife-DC Coordinator since its inception. She is active in parish ministries at St. Mary Orthodox Church, Falls Church, VA.